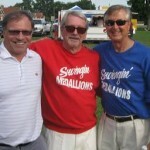 The Swingin Medallions got their start in the Town of Ninety Six. A small local group started by John McElrath, a native of Ninety Six, the group would play at the local pool hall which once existed on a row of buildings called Pender Row. The group played at birthday parties and functions throughout town and were known as the Medallions at the time. Larry Roark, Bobby Crowder, Dwight Styron, Ronnie Stone, Cubby Culbertson, Jimmy Roark, Johnny Hancock, Richard Hall, Carroll Bledsoe, Fred Pugh, Perrin Gleaton, Rick Godwin, Joe Morris, and John McElrath. 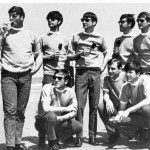 Through the years the members in the band have changed, the band, originally known as the Medallions changed their name and slowly evolved into the famous “Beach Music” group we know them as today. Once known as the Party Band of the South, they would play at college frat parties and night clubs throughout Myrtle Beach. The popular dance of South Carolina “The Shag” became synonymous with the groups song “Shaggin in the Moonlight”. 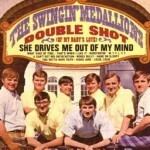 “Double Shot of My Babys Love”, “Hey Hey Baby” and “She Drives Me Out of My Mind” were in the top 40 hits in the mid 1960’s. The group toured nationwide and produced several top selling albums. The group was also featured in The band has performed throughout the nation in thousands of venues. In 2007, they were chosen to headline the Inaugural Party for the Governor of South Carolina and for the Governor of Georgia, Sonny Perdue’s Inaugural Ball. They were selected as the headline act for the 2004 Gator Bowl halftime show. In addition, the band hosts a cruise each year for its fans. In 2003, they combined their cruise with the Coors Sterling Marlin Cruise. The group today has changed, with most of the original members no longer playing with the group. In 2013 the group “came home” and played at the SC Festival of Stars, an Independence Day Celebration held in Ninety Six and were the Friday Night headliners for the “Concert in the Park”. All the living original members of the Double Shot of My Babys Love album were present, along with a plethora of fans who took photos, had albums signed and reminisced about the groups days in Ninety Six as young men. A beach band book called “Heeey Baby Days of Beach Music”, was officially released October 6, 2006 at the Georgia Music Hall of Fame in Macon, Georgia. It is a comprehensive book of the Southeastern Music Scene of the 1960’s and features the Swingin’ Medallions along with numerous other bands of the era. 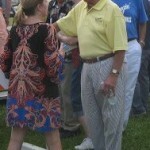 The book author is seen here during the 2013 Ninety Six SC Festival of Stars Festival with band members. A signed copy of the book from that day is on display at the 96 Visitor Center, 97 Main Street, Ninety Six. Visit www.heybabydays.com for more information on the book and the band. You may also visit the bands websites and facebook pages for information on upcoming shows.